Israel’s Justice Minister recently appeared in an ad spraying herself with “fascism” perfume and saying “it’s the scent of democracy.” Her party has defended the ad as satirical mockery of leftist criticism, but an Israeli activist told Sputnik the minister’s politics speak for themselves. In the 44-second-long video posted on Israeli Justice Minister Ayelet Shaked's Twitter page Monday, Shaked is seen striking sultry poses as a voice-over of her lists in Hebrew the names of different policies she supports, such as "separation of powers," Sputnik reported. At the end of the video, she picks up a bottle of perfume labeled "fascism," sprays herself with it, and says to the camera: "I dunno. For me, it's the scent of democracy." ​However, as criticism mounted of the ad, some of Shaked's defenders rush to explain that the ad isn't supposed to be pro-fascist, but rather a mockery of leftist criticism of Shaked's policies. Miko Peled, author of "The General's Son: The Journey of an Israeli in Palestine" and "Injustice: The Story of the Holy Land Foundation Five," told Radio Sputnik's Loud and Clear Tuesday that the ad would provoke "the same reaction as people here [in the US] have to Donald Trump: the people who love him, love him, so they like everything he does, and the people that realize he's a nut are appalled, and I think this is going to have the same effect." ​Peled recalled another ad he'd seen in which "one of these right-wing lunatics" is seen riding a horse "like a scene from some medieval movie" and killing Knesset member Ahmad Tibi, who represents the Arab Movement for Change (Ta'al) party. 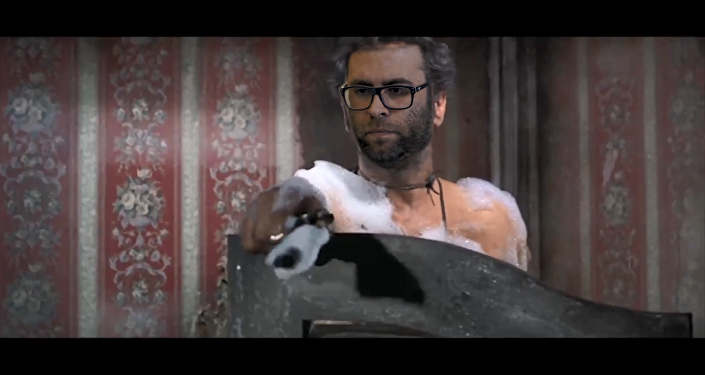 Sputnik reported Tuesday on another ad in which another politician, MK Oren Hazan, founder of the Likud splinter party Tzomet, portrays himself as "Tuco" from the 1966 Spaghetti Western film "The Good, the Bad and the Ugly," in the iconic scene where Tuco shoots a one-armed assassin and admonishes him: "When you have to shoot, shoot. Don't talk!" The assassin is portrayed as Jamal Zahalka, an Arab Israeli MK from the Balad party. Zahalka has issued a formal complaint and sought to have the video removed from Facebook for inciting violence. "The mood in Israel," Peled said, is that "whoever reaches the farthest-most right in the political spectrum is going to win. That's what this is about, and they have these people who have the political IQ of ants, I think; it's really quite shocking." Show co-host John Kiriakou recalled the number of political splinters to the right as well as alliances with far-right parties in recent months in Israel. Hazan's Tzomet, a party he formed when it became apparent that his "bad boy" antics in parliament, as Haaretz once called them, had gotten him placed at the very bottom of Likud's candidates list, is just one example. Another is MK Naftali Bennett, who left Habayit Hayehudi, or the "Jewish Home Party," which he headed at the time, in December to found his new party, called "New Right." Jewish Home has been described as "Israel's KKK," Haaretz reported, and was also Shaked's party before she followed Bennett to New Right. Sputnik reported earlier this month on an alliance penned between Likud, which is headed by Israeli Prime Minister Benjamin Netanyahu, and Jewish Home, as well as the other parties Tkuma (Resurrection) and Otzma Yehudit (Jewish Power). The latter is a group that takes after a racist, anti-Arab rabbi named Meir Kahane who founded a fascist gang called the Jewish Defense League and was banned from Knesset elections in 1988 for his racist rhetoric and support for anti-Arab terrorism. A Jewish Power candidate, Ben Ari, was barred on Sunday from participation in the upcoming Knesset elections for similar reasons to Kahane's prohibition, Haaretz reported. "Netanyahu won the race when he aligned himself with these former Kahane people," Peled told Kiriakou and co-host Brian Becker. "His alliance was a smart move, even though some of the people he's aligned with have been disqualified from running… I think in this chaos, in this atmosphere, he absolutely is the most sensible, most statesmanlike of all of them, and the most experienced. I think this is, in the end, absolutely going to help him, and all of these guys are going to be asking him for a job after the elections." "I think there's so many ultra-right-wing, neo-Nazi-type of parties running right now, and the differences between them are marginal. The differences between them are the people," Peled said. "Ideologically, they're all the same." Peled said Shaked's restraining of the judiciary, about which she boasts in the ad, was indeed a far-right move, because in Israel, the judiciary, "just like here in America, has the reputation of being ‘too liberal,' too far left." He also said Shaked had championed and ensured the passage of racist laws targeting Palestinians that "strengthened the legal aspect of right-wing politics in Israel," something he noted was "very popular." "I don't know that she offers… any more than any of these other right-wing crazies, except that in her case, this political party with her and Bennett, they are not coming across as a religious party; they're coming across as a union between religious and secular. So the secular fascists can vote for them as well, and they don't have to vote for Netanyahu." However, Peled cautioned that Shaked's political destiny following the elections lay in the "horse trading" between parties according to how many votes their list received. In Israel, voters select between parties or party blocs, and the parties then award Knesset seats based on how many votes they get and according to lists of politicians previously agreed upon. Peled said he thought Netanyahu would easily weather the gathering storm of Blue and White, a political bloc formed by Benny Gantz, a former Israel Defense Force chief of staff. Netanyahu "has gravitas, he's a shrewd politicians, and he's got a very impressive list of accomplishments that no Israeli prime minister, certainly no Israeli politician today, can compete with." Compared to him, Peled said "all the other [politicians] are just a bunch of children running around."